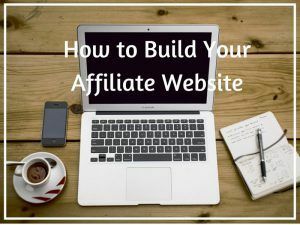 Before you move on to learn how to build your own affiliate website, I would like to explain a few terms relating to this topic. They can be quite confusing for beginners, but once you know what they are, then you’ll understand how they link to one another. I am going to use my site as an example. Website Name – Time Rich Worry Free is the name of the website. Domain name – timerichworryfree.com is the domain address, which is a sequence of words that make up a unique URL. Host – A server company that stores and backup all your web files. In my case, SiteRubix is my host. Theme – Infrastructural designs that determine how your site would look like. I use a Premium Theme called Genesis. Plugins and widgets – These are WordPress features that allow you to customize various functions on your site to improve search engine visibility and better user navigation. How to Build Your Own Affiliate Website? A domain name is the brand name that reflects your online business. In the previous topic about finding a niche, we also talked about serving a specific audience. What kind of name do you want your business to be called? Here are some tips to help you out. First and foremost, think about words that are short and simple to remember. It also has to be spelled correctly for easy pronunciation. Avoid hyphens, numbers or slangs as they can be confusing. Keywords are words that have intentional meaning related to your niche. For example, if the domain is called ‘benefitsofyogatherapy.com’, it’s clearly related to the Yoga niche. Brand names, on the other hand, are names or concept that represents a business. Read this post to learn how to select an online business name. This is the suffix of a domain name such as .com, .net, and .org. Although new extensions are being promoted all the time, the common one that people always use for an online business is .com. Most importantly, you want to make sure that the domain name is unique and doesn’t infringe the copyright of another company’s brand. Even if you attempt to make it sounds the same, but with different spellings – don’t. You never know when you would violate the law and get into unnecessary legal issues. Once you have chosen your domain name, head over to SiteDomain, to check for its availability. The registration for a custom domain name will cost between $13.99 to $15.99/year. When you buy a custom domain, it’s your virtual property and the value can appreciate over time as your website grow. At some point, if you decide to sell it, you can actually earn much more than the price you initially paid for. So, consider it an investment option. If, for whatever reasons, you are not ready to purchase a custom domain, you can always create a subdomain for free using SiteRubix. Simply type your desired domain in the plugin below and you are ready to go. SiteRubix also offers one of the best hosting on the internet so if you already owned a custom domain and would like to take advantage of this hosting provider, find out how to move your website to WordPress here. WordPress is one of the most popular publishing platform used by bloggers, affiliate marketers and even corporate business. It’s a free software that allows various methods of monetization on a website (unlike WordPress.com). It’s also great for organizing content on a large scale. If you are already using the hosting service on SiteRubix, setting up a website is a breeze. Unlike other providers, WordPress is automatically installed with just one click; no downloads and no codings are required. You just need to go to the login details that are auto generated and enter your site from there. 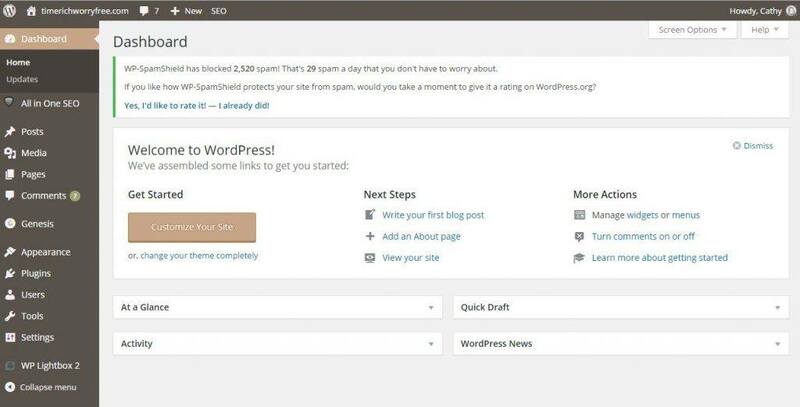 Inside WordPress, your dashboard is going to look something like this. The features on the left hand side panel are the ones that you’ll be using a lot in building your website, but before that, there are a few housekeeping to do. Activate and update plugins – WordPress at SiteRubix is preinstalled with a powerful SEO plugin to help your website rank better on the search engines. Delete all the default posts, pages and comments as they don’t serve any purposeful content for your site. Simply search for them on each of the features and move them to trash. Choose a free WordPress theme for your content layout, if you haven’t already done so. Up until this point, you have chosen an awesome domain name and created a WordPress website. However, it wouldn’t worth anything if you don’t make your affiliate website visible to the search engine. Fortunately, there’s one plugin that can do this work for you effectively. It’s called the All In One SEO Pack and these are the settings that you need to tweak to optimize a site. Home Page Settings – Optimize the front end of your website as it appears on the search results. Webmaster Verification – Allow search engines to generate traffic data for your site. Page/Posts Settings – Optimize individual post and page for search results and social media sharing. For more details, learn how to set up the All in One SEO plugin here. With these 3 simple steps, your affiliate website is now ready to go live on the internet. The only thing that’s missing is website content which will contain keywords used for ranking and for targeting your niche audience. Are you ready for the next exciting step? Read more about how to write content for a niche here.